It’s easy for women; most have shoes they can wear to any event. Men are much simpler that way because they don’t really bother with shoes. However, there are times when you should pay attention to what you’re wearing because the wrong pair of shoes can make you look unprofessional. And it’s true. Some men tend to not bother with buying dress shoes, which is why when they suddenly need a pair they end up spending money on the wrong kind. 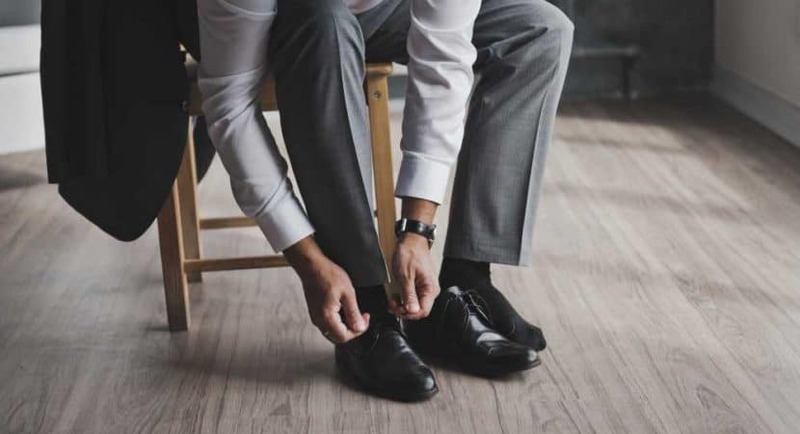 Indeed, we all have different needs and preferences, but we’ve listed a few types of dress shoes that you will want to add to your shoe closet. Every man needs to have a pair of Oxford dress shoes for formal events, and the black cap toe model is the one you could never go wrong with. If you are wearing a classic tuxedo or suit, then the Oxford dress shoe will give you a sophisticated, ‘I’m-ready-to-do-this’ kind of vibe. The Faranzi Oxford dress shoes might be a good example since they have everything that classic dress shoes are supposed to offer. On the other hand, if the formal event that you are planning to attend is not a business meeting, you may want something that will make you look formal and interesting at the same time. A pair of dress shoes with a wingtip, for example, such as the Bolano shoes may be a smart choice. Not only are they very formal, but they are also known to receive many compliments. Bear in mind that these types of dress shoes should only be worn with formal attire. A pair of Asher Greens will also work wonderfully for a formal event since the colors are dark and neutral enough to seem elegant. Remember, however, that these types of shoes are only good for environments where you already know your business partner. When in doubt, you should always go for the classic black Oxford shoes. Most people confuse the derby shoe with the Oxford shoe simply because they look similar. In a way, that’s true; the derby is a variation of the Oxford shoe. However, unlike the Oxford, a pair of derby shoes will have an open lacing system that will not restrict the top of the foot so much. They have been made for comfort, and if you sometimes have problems with classic Oxford shoes, then a pair of Derbies may be a better choice for you. The good part about derby shoes is that you can also wear them for both formal and casual events. They are less formal than an Oxford, which is why you could easily match them with a pair of jeans or khakis. One example of a good pair of derbies would be the Santiago Luciano dress shoes, a comfortable model with a wingtip and a color that can work with pretty much any type of a smart casual outfit. Similarly, if you are not the type to go for boring brown dress shoes, then you’ll need something made from fabric. These models are more appropriate for formal events such as weddings or proms, where people are actually invited to dress up and stand out. The Viotti striped satin derby shoes are a popular choice and you can find them in many colors to fit any type of formal attire – or even a pair of jeans if you make the effort to match them. While many people may argue that a loafer (or slip-on) is not a dress shoe, the truth is that they actually are dress shoes. Just because they do not have shoelaces, it doesn’t mean that they have to go into the informal category. Indeed, loafers are a bit more casual than the Oxford shoe, so you might want to avoid wearing them to a very formal meeting. However, if you want to look elegant on a daily basis without having to wear just Oxford shoes, then you need a pair of loafers. One example of a good pair of loafers is the Dockers model, which may be purchased in different colors (the darker the color, the more formal they will be), or a pair such as the Giorgio Brutini if you are looking for something more casual. Furthermore, if you really want to stand out, you should go for a pair of Amali dress shoes. Their colorful black and metallic design will surely get you many compliments. These types of dress shoes have an Oxford-ish design to them, but like the derby, they are also a variation that goes with more informal clothing. They are usually made from suede, calfskin, or fabric, and have a rubber sole that is generally found in tan, brown, or buff. Bucks are known for their comfort, which is why many people choose them if they have to wander on uneven terrain. They are also a great choice if you like to be rather formal, yet you still can’t wear anything else besides jeans. This type of dress shoe is mostly popular among youths since they are semi-formal yet fresh-looking. One example of a good pair of bucks would be the 4HOW dress shoes made from suede leather. They are very comfortable and, depending on the color that you choose, will have a multitude of pairing choices. If you’re the kind who doesn’t like to be too formal all day, then a pair of bucks may be a good choice for you. This style of shoe is well-known by the strap that sits across the top. They can sometimes include a buckle, and tend to come in the standard tones that you’d expect from dress shoes such as black and shades of brown. Though in some rare cases, you might find some colors that stand out more. These are often chosen by those who want to stand out rather than wearing the standard dress shoes expected from men. They can have single or double straps, depending on your preference. Though most people prefer the single strap as they tend to have a more classic appearance. Many people are interested to find that this style actually dates back a long time. Initially, they were worn by monks to replace the standard sandals. These days, they are much more of a luxury that rests among the most stylish of shoe options. Brogue shoes stand out due to the holes that are often found within them. In modern times, it adds to the detail and is often designed in aesthetically pleasing ways. One such example of these shoes are Wingtips, which are made with a longer toecap and some added detail. These can also be found in both of the earlier-mentioned derby and Oxford styles, though those certainly aren’t the only two. You can also find them with longer or more rounded toes, allowing you to really get the style that will work best for your preferences. Another great aspect is that you can find versions of these shoes that work for a wide range of environments, from the formal to the completely casual. Many people like to use them to spruce up their casual look with a touch of something classic in appearance. There are also multiple grains that you can choose from. For those who want to step outside the range of shoes and into the world of boots, the Chelsea Boot can allow you to do that without having to sacrifice the formal look. They are often quite comfortable, easy to put on and wear and have been popularized in several different periods in history. From The British Invason to Queen Victoria, these boots have made their way all over. Because such sought-after individuals and groups have worn them, you can certainly trust that they have the style to work today! The good news is, the modern brands have been updated to meet the standards of modern style. Like the Brogues, these boots can also be worn in a number of different situations. They can work well with jeans, slacks, or suits so that you can mix and match them just the way you want. It may even help to have a few different colors for style in multiple forms! Every man will usually want a few different types of dress shoes in their life: the Oxford, the derby, the loafer, and the buck can all be excellent choices. Since there are times when you need to be formal but other times more informal, you will need to have the appropriate shoes and dress accordingly for them. If you’re looking to impress at an interview or business collaboration, then you’ll need a pair of classic black Oxford shoes. On the other hand, if you want to take your girlfriend on a casual date to the park, then a pair of bucks might be the better choice.